Upon your arrival in Yangon, welcome by our tour guide and transferred to your hotel for check-in. Enjoy private tour and drive through downtown to explore the city centre and its fabulous mix of architecture and sites. The streets are filled with historical buildings many of which have a faded colonial charm not seen elsewhere in Asia. You’ll start at the post office – a lovely historic building, passing by Strand Hotel, Mahabandoola Garden and Independence Monument along the way. Then visit famous Chauk Htat Kyi, home to a 70-meter long reclining Buddha. The feet of the statue carved with traditional symbols and often many locals gathering to pay homage and pray. Photo stop at the Karaweik Hall royal floating barge. Nothing will prepare you for Shwedagon Pagoda, with its glittering gold stupa. At the pagoda observe local pilgrims and monks offering their devotions and enjoy the amazing sunset view at Shwedagon pagoda. Morning flight to Bagan. 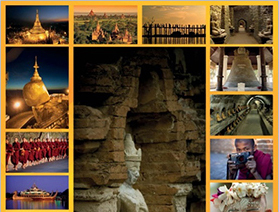 Upon arrival drive from Bagan to head south over the Irrawaddy River on safari adventure. This journey will bring you past vast plains and gentle hills, through the isolated villages of Ka Zun Ma and Nga Ga Bwe, and to the foot of Chin Hill, where the landscape becomes less dusty and more lush and green. Your final destination for the evening is the beautiful mountain village of Kanpetlet, overnight at Pinewood Villa Resort. After breakfast at your hotel, spend the day exploring the town of Kanpetlet, set on a mountain ridge between two deep valleys. You may visit a local house to learn about the tattoo tradition of the Chin Tribe: meet women with different face tattoos and learn about the history, meaning, and process of this longstanding custom. After breakfast, you’ll embark on ride and then a trek to the summit of Mount Victoria, the highest peak in the Chin state, where you can take in incredible panoramic views. Enjoy a picnic lunch at a rest house after trekking down three hours to the base of the mountain, and then relax on the short 1-hour drive to Aye village – located 5,800 feet above sea level. Overnight at Mindat. Today, you’ll visit several local Chin villages to meet local people and learn more about traditional tribal life and custom. Then visit the village sites, including the sacrifice post and the traditional circle stone slab cemetery. Overnight at Mindat. After breakfast, drive back to Bagan (about 7 hours). You will spend the day exploring the architectural masterpieces of this amazing town by visit to a diverse selection of the most important pagodas and temples. In the late afternoon climb to the top of the Temple for sunset views. Sit back relax and be amazed by the beauty of Bagan as you watch the sun slowly set behind the ancient Pagodas. Morning flight back to Yangon. This private tour can be arranged for single traveler, couple, family and group tour. Prices vary according to hotel standard, when you travel, how many people you travel with, the level of private guiding required and the overall arrangements. Infrastructure in Chin State area is not well developing yet. This tour is design for more of the adventurous travelers. Please contact us to discuss your individual requirements.